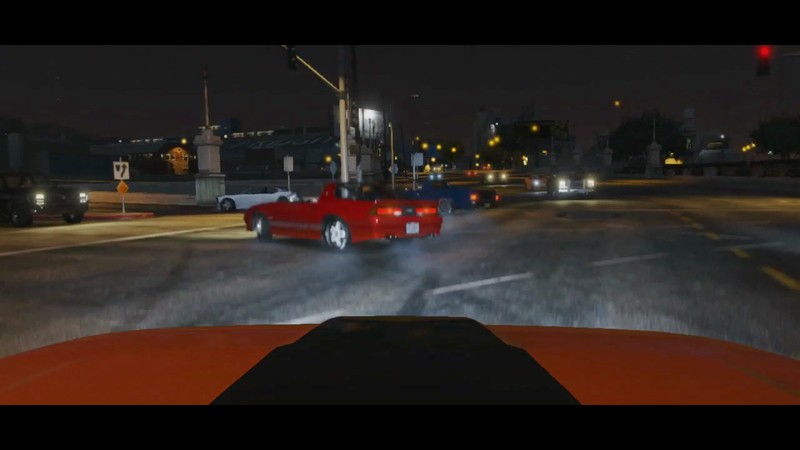 Rockstar has upped the ante especially for those who live in Los Santos' fast lane. Money doesn't grow on trees but it does hang from the helpless saps cruising the LS streets and all weekend, High Stakes Impromptu Races will make plucking it from them all the sweeter. Stakes and payouts to Impromptu Races will be doubled so lining up in your Pegassi Zentorno against a mark carries exhilirating big time risk and reward. You can start an Impromptu Race via the Interaction Menu and remember: you've got to accelerate to accumulate. Put your money where your mouth is. For all high rollers, the Max Bet limit for all Jobs will be raised to GTA$10,000 so you can lay both cash and cajones on the table. And because even relaxation should come with an attractive rate of return, all golf and tennis RP bonuses will be tripled all weekend. That means a birdie will see you earn 600 RP while a cheeky hole-in-one on the short Hole 6 will put 3000 RP on your scorecard and turn your opponents greener than the fairway. Look for a windfall of valuable commodities dropping from on high with Event Crate Drops falling from the skies in such locations as the Vinewood Sign, the Observatory, Del Perro Pier, La Fuenta Blanca horse stables and the Vinewood Racetrack. The Crates will be stuffed with huge RP bonuses as well as GTA$ stacks, heavy-duty RPGs, miniguns, sticky bombs and more. Snap your flashiest shots showing off exactly how you're living the High Life between now and end of day Sunday and tag them #HIGHLIFE for a chance to win big. Rockstar is looking for your most epic, most creative, most amusing or most artfully composed moments over the weekend featuring any of the new apartments, luxury vehicles, toasts/celebrations, haute outfits, or weaponry from The High Life Update. 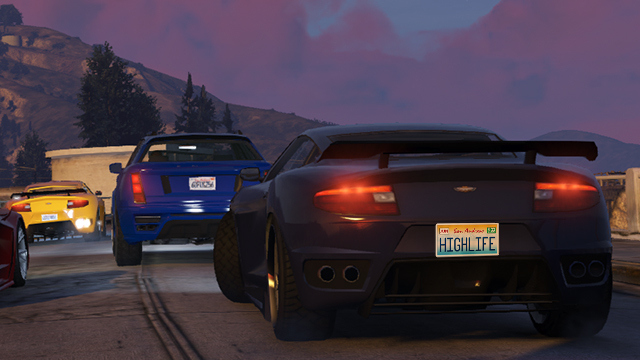 They'll pick five (5) favorites to award GTA$1M as well as the exclusive 'HIGHLIFE' in-game vanity license plate to deck out your shiny new ride. Tune in to a full slate of awesome High Life Weekend live-streams starting with Rockstar's own official Rockstar Broadcast tomorrow, Friday May 16th from 4-6pm ET with very special guests Rooster Teeth joining them via Skype for two hours of live mayhem, hijinks, and playthroughs of the brand new High Life Update Jobs and gear. Something tells us Mental States may get blisteringly red. They'll be streaming across the Social Club Multiplayer Events page, the Rockstar Games Twitch.tv channel and the Rockstar YouTube channel. Tune in and join the fun in the Rockstar-hosted chat at Twitch and at Social Club as well. 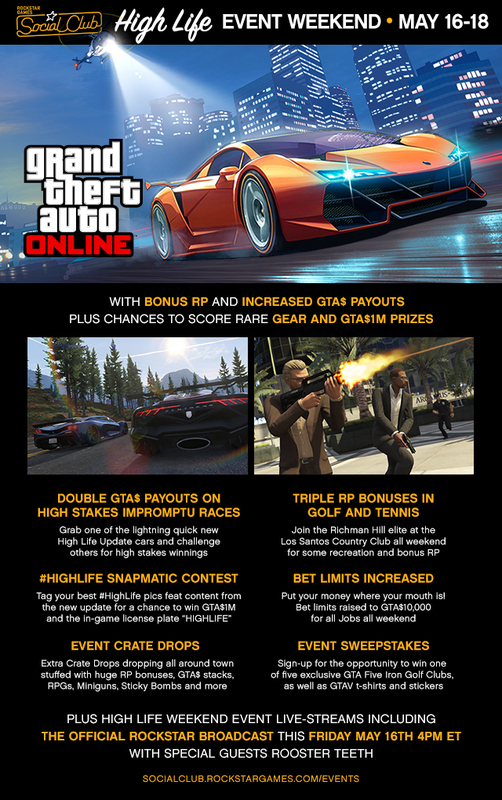 While Los Santos Country Club is handing out triple RP for golf bonuses this weekend, Rockstar will also be giving away real life golf related goodies in the High Life Social Club Event Sweepstakes. 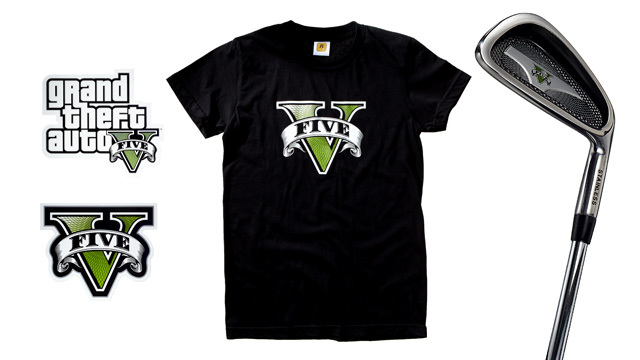 Five (5) lucky winners will each win the limited-edition GTA Five Iron Golf Club as well as official GTAV t-shirts and stickers. Ten (10) runners-up will also score Rockstar Prize Packs of an official t-shirt and stickers. You can enter to win right now through Sunday right here. See Official Rules. See you this weekend and have fun! Crew up in the forums! Congrats to D-O for winning the Snapmatic Contest! The High Life Event Weekend: Bonuses/Contests/More - Win back the money you spent to live the High Life this weekend plus real-life prizes through contests!